Well, from the title of this you can probably guess that we're announcing things. New things. Things only the staff know about (I think... we may have a leak idk). A huge thank you to everyone that filled out our survey! Your feedback has really helped us work on improving the services we provide. If you haven't already done the survey, you still can - just click here. The following plans and changes are mainly a direct result of the responses we were given. I want to note though - there are no dates set for these to be completed/opened yet. They are planned or in progress, and should be available soon™. The first area of the server you see when you join. We're likely long overdue for a new one by now. We've been hard at work over the past few months making something truly special. That's literally all the details I'm going to give for now... apart from this: The first 50 VIP+ members will be featured in the spawn. Once these are placed they're not changing, so if you wanna be there in spawn, either be a staff member, or buy VIP+ before there are 50 people with it. Our shop has been under some criticism in the past. Mainly because it's almost impossible to find your way around. Even I get lost and I built the thing. 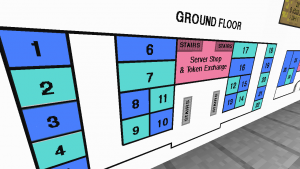 So we are building a new shop, with a far simpler layout - and even a map. As you can see, that is in fact a map. The new shop will contain everything the current shop has, with some additional items in the server shop. We're also keeping the rentable shops, only we're numbering them properly so you can tell people exactly which shop is yours! Be excited people. Tokens are cool aren't they? Well, we're planning more ways to use them. Including an overhaul of the token exchange to allow us to do some other cool things. ie. ThePotato, EdiblePotato, xPotato, PotatoSoul, BrownPotato, PotatoPotato, SadPotato, etc. Thank you and have a great Potato.